The children of the American Colony present a Fourth of July show, complete with a human Statue of Liberty, telling the history of the United States, Jerusalem, early 20th century. American Colony in Jerusalem Collection, The American Colony Hotel, Jerusalem. In the mid-19th century, United States foreign policy emerged from its traditional non-involvement in the East. Beginning in Istanbul, and then in the Holy Land, Americans came as private citizens or as official emissaries. The appointment of American consuls was often based on personal connections or the spoils system rather than professional ability. The post in Jerusalem lacked stability, and no fewer than 16 consuls served there from 1857 until the outbreak of the First World War. This exhibition deals with the relationship that developed between the United States of America and the Holy Land, starting in 1844. It is a collaboration of the Shapell Manuscript Foundation and the National Library of Israel. Presented here is a selection of items on display at the exhibition. You can also visit the Virtual Tour by Ardon Bar-Hama for a unique immersive experience. Rabbi Isaac Leeser's review of convert and early American zionist Warder Cresson's, "The Key of David." Shapell Manuscript Collection. WARDER CRESSON came from an evangelical Quaker family. He was convinced that the redemption of the Jewish people was a necessary condition for the Christian Salvation. His friends appealed to Secretary of State, John C. Calhoun, to appoint him U.S. consul in Jerusalem. Cresson set out in 1844, but American officials became aware of Cresson’s controversial character, and the appointment was rescinded by the U.S. government a month later. Cresson continued to represent himself as the American consul and conducted himself with appropriate aplomb. In 1848, he converted to Judaism, changed his name to Michael Boaz Israel, and divorced his wife. Cresson returned to Jerusalem, remarried, and worked to develop agriculture as a way of improving the condition of the Jews. He died in Jerusalem in 1860 and was buried on the Mount of Olives. Abraham Lincoln endorses a proposed counsel at Jerusalem, October 29th, 1861. Shapell Manuscript Collection. After the failure of Warder Cresson’s appointment, the post remained vacant for 13 years, until 1857. The United States government’s preoccupation with domestic issues in the mid-19th century was one of the reasons the post was neglected. A serious problem with the selection process was the American “spoils system,” whereby the victorious political party distributed jobs and other largesse to its supporters. Despite the gradual shift toward a merit system in the later years of the century, consuls continued to be appointed on the basis of their closeness to the administration or to intermediaries, or sometimes simply because they wanted the position for their own reasons. Most of the Jerusalem consuls served for particularly short terms; their lack of professional diplomatic experience obstructed the enhancement of the American presence in the Holy Land. Alongside the U.S. diplomatic activity that gradually began to establish an American presence in the Holy Land, a series of colonies were set up by American religious groups in the second half of the 19th century. Clorinda Minor led the group that established Mount Hope, near Jaffa, in 1855, and George Adams, a preacher from Maine, brought his followers to the same area in 1866: both colonies were abandoned within a few years. In 1881, Jerusalem’s so-called American Colony was founded by a group led by the Spafford family of Chicago. Wooden houses imported from the United States began to appear in the Jaffa cityscape, and Fourth of July celebrations in the American Colony were soon a fixture on Jerusalem‘s local calendar. The American colonies and their residents became the concern of the U.S. consuls, for better or for worse. Wooden houses, brought from Maine to Jaffa by American settlers, early 20th century Courtesy of Peter Hoffman and Shay Farkas. President Franklin Pierce appoints the first United States consul to serve in Jerusalem. Shapell Manuscript Collection. JOHN WARREN GORHAM, a physician and scion of an established Boston family, was appointed as the first official U.S. consul in Jerusalem in 1856, in recognition of his support of President Franklin Pierce. The most significant incident during his term of office was the attack on the small American colony of Mount Hope, near Jaffa. The consul rushed to the aid of the Americans there and attended to their needs. The rest of his stay in Jerusalem passed uneventfully. Overcome by boredom, he began drinking heavily, and was recalled in 1860 by President James Buchanan. In 1855, a group of German and American millennial Christians established a farming community called Mount Hope, near the port town of Jaffa. They were led by Clorinda Minor of Philadelphia; but when she died in 1855, some members of the community left. Two families, related by marriage, remained: the Prussian Steinbecks and the American Dicksons. The settlers suffered from malaria and from constant harassment by nomadic Bedouin and Arab villagers in the area. On the night of January 11, 1858, the settlement was attacked by five Arab robbers. Friedrich Steinbeck was murdered, and his wife, Mary, and mother-in-law, Sarah Dickson, were raped. Gorham, the American consul, hurried to Jaffa, where he took evidence from the victims. A U.S. Navy vessel approached the shores of Palestine to encourage the authorities to undertake a thorough investigation of the incident and bring the guilty to justice. "...They caught my daughter, Mrs. Steinbeck, by the arm; she caught hold of me; they struck her with the breech of their guns, and forced her to let go her hold. She then caught hold of the bedstead, and they pulled it over; in the bed were my daughter and Mrs. Steinbeck's two children. They took her... and dragged her out of doors. One man staid [sic] in the house and four went out; they came back in about half an hour. While Mrs. Steinbeck was out of the house, the remaining man dragged Mrs. Dickson into the adjoining room..." - From the testimony of Walter Dickson to Consul Gorham, Jaffa, January 16, 1858. 1858 Senate Report regarding the "Outrage at Jaffa" in which the American Dickson Agricultural Colony was brutally attacked. Shapell Manuscript Collection. From the 1858 “Outrage at Jaffa” to the lecture platform: a broadside advertising “Dickson’s Palestine Museum.” Shapell Manuscript Collection. What was left of the traumatized Dickson family left for the United States, albeit son Henry stayed behind a bit, to wrangle with the American Consul in Constantinople over possible restitution. This broadside, advertising his lecture on the “Customs, Ways of Living, Houses, Dress, Language, of which he has perfect knowledge, Treatment of Women, Modes of Conveyances, annoyances, &c” of Arab life, suggests that Henry might have needed money on his return. Dressed as “an Arab,” smoking a hookah, and exhibiting such rarities as matzo and pomegranates, Dickson took to the stage – until at least, the outbreak of war, when he enlisted at the first call for troops. WILLIAM PAGE had sailed to the East in his youth and lived in Istanbul. When his business in the U.S. foundered, he returned to Istanbul and was offered the post of consul in Jerusalem. Accused of selling American citizenships, he was forced to resign his position after only one year. FRANKLIN OLCOTT was a businessman and a scholar of the Ancient Near East. Friends helped him secure an appointment that he believed would afford him free time to pursue his research. The Secretary of State hoped that Olcott’s background in economics and business would be used to strengthen commercial ties with the Middle East. The consul drew attention to the difficulties of trade with the Ottoman Empire, citing the corruption and indolence of its officials. After little more than a year, Olcott asked to be relieved of his position. The American flag flies over the first permanent residence of the U.S. Consulate in Jerusalem, inside Jaffa Gate. From Frank S. DeHass, Buried Cities Recovered, 1883. ISAAC VAN ETTEN, who was appointed consul in 1863 as a representative of the state of Minnesota, viewed Jerusalem as a blighted land. He agreed to accept the position, but held it for a mere five months before submitting his resignation. Appointment of Albert Rhodes, The McLellan Lincoln Collection, John Hay Library, Brown University Library. ALBERT RHODES, a career diplomat from Pennsylvania, also did not fall under the spell of the Holy City that overcame so many others who had visited or served in Jerusalem. He recorded his impressions in a book, Jerusalem As It Is, describing the country and its inhabitants with a sharp pen. His sharpest arrows were aimed at members of the various ethnic communities and religious groups, including the Jews, who were living on support from abroad. In 1865, he requested a transfer to a more important post, as he put it, befitting his linguistic skills. Richard Beardsley. "Kathedra" magazine, Yad Ben Tzvi. January, 1994. French journalist VICTOR BEAUBOUCHER became enamored of the American ideas of freedom. He volunteered for the Union forces in the Civil War and was wounded in battle. He continued to live in the United States but was never granted American citizenship. He was, however, appointed the U.S. consul in Jerusalem in 1865. His term of office witnessed stormy incidents concerning the Americans in Jaffa (the Adams colony) and severe differences with the Jewish community. Citing declining health, Beauboucher requested a transfer to a more amenable post. RICHARD BEARDSLEY was a jurist and expert in international law who served in the Union army in the Civil War. In 1870, he was appointed consul in Jerusalem. During his term of office, he took great interest in tourism and archaeology, and believed in the country’s potential in these fields. After three years, he asked for a transfer to a more important location and a more comfortable climate. Joshua Chamberlain and William Seward assist the Jaffa Adams colonists in 1867. Shapell Manuscript Collection. “…concerning the Jaffa Colonists, I have the honor to invite your attention to the fact that information has reached the Department showing that a new party will set out from Maine to Jaffa at the end of August. It is historically true, I believe, as a general fact that Colonies always suffer great embarassment in the beginning, and yet that, when fed by reinforcements, they have finally very often succeeded. 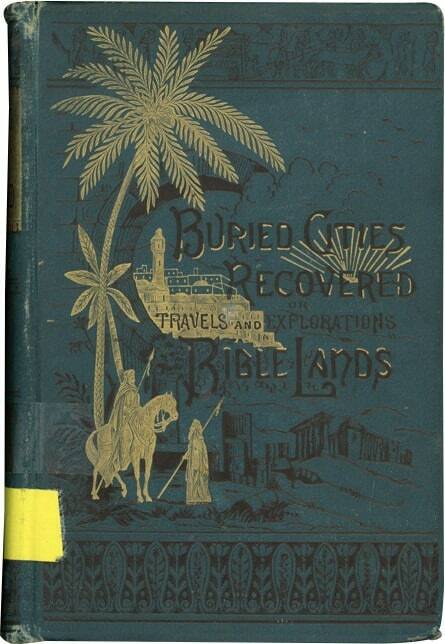 Buried Cities Recovered or Explorations in Bible Lands, 1883. Frank DeHass. National Library of Israel. FRANK DEHASS’s desire to advance research of the Holy Land drove his efforts to be appointed U.S. consul in Jerusalem. He had no diplomatic experience, but his support of President Grant won him the post in 1873. In defiance of the official position of not awarding U.S. citizenship to foreign subjects, DeHass conducted a policy of unqualified support for the Jews, and granted American patronage to dozens of them. He came under fire from all directions for his interference in internal quarrels in the Jewish community, forcing his retirement in 1877. JOSEPH WILLSON was a military man and newspaper editor. During his term in Jerusalem he hosted former President, Gen. Ulysses Grant, dealt with the issue of patronage for the Jews, and resolved the issues his predecessor had brought about. At the end of a five-year term, he requested a transfer to a more important post. James A. Garfield’s Appointment of the Anti-Semitic Selah Merrill as Consul at Jerusalem. Shapell Manuscript Collection. SELAH MERRILL, an ordained minister and a scholar of the history, archaeology and natural history of the Holy Land, was the longest-serving U.S. consul in Jerusalem. He was first appointed in 1882, and served his various terms of office under Republican administrations, with which he had a close relationship. Merrill’s first term coincided with the beginning of the First Aliyah and the settlement of a group of American Christians in Jerusalem. The conservative consul was known for his hostility toward the Jews and their settlement project in Palestine, and for the harassment of his compatriots in the city’s American Colony. Early carte-de-visite photo of longtime U.S. Consul to Jerusalem, Selah Merrill. Shapell Manuscript Collection. Even before Selah Merrill took up his first post as consul, he was familiar with the country from previous expeditions undertaken on behalf of the American Palestine Exploration Society. He published several books and dozens of articles on the history, antiquities and landscapes of the Holy Land, and conducted field observations of its flora and fauna. Part of his collection is still preserved in Harvard University’s Semitic Museum and its Museum of Comparative Zoology. A “Song of Praise” celebrating the yishuv’s welcome of Lew Wallace to Jerusalem. Shapell Manuscript Collection. LEW WALLACE, army general, governor and writer, was appointed U.S. ambassador to Istanbul in 1881. A year earlier Wallace published his historical novel, Ben-Hur, an unprecedented bestseller set in Judea at the time of Jesus. Wallace was sympathetic to the new Jewish settlement in the Holy Land, the First Aliyah (wave of immigration), which was just in its early days. Wallace’s official visit to the country, in the winter of 1883, aroused considerable interest in the Jewish community, especially among those with American citizenship. The Jewish press covered the arrival of ”the American envoy” [the ambassador] in detail: “Our brethren who are American subjects, went out to greet him with an American flag in their hands,” wrote Hamagidon January 11, 1883. The Turkish authorities, on the other hand, received the ambassador somewhat coolly. His arrival on the eve of Shabbat, forced Joseph Kriger, the Pasha’s Jewish secretary, to cut short the official reception. Wallace was incensed and lodged a complaint against Kriger. The incident led to impassioned exchanges in the local press. Lew Wallace’s signed "Minister Resident of the United States of America to Turkey" calling card. Shapell Manuscript Collection. Lewis Wallace served as Resident Minister in Instanbul from 1881-1885. NAGEEB ARBEELY was a physician of Greek Orthodox background, born in Damascus. When he was a boy, his family moved to the United States and Arbeely became an American citizen in the state of Tennessee. After the recall of Selah Merrill, President Grover Cleveland appointed the young Arbeely (24) as U.S. consul in Jerusalem. The American Colony and the city’s Muslim residents welcomed the sympathetic consul. The Turks, on the other hand, refused to accept his credentials, asserting that as a native of the Ottoman Empire, he was a Turkish subject, not an American one. There was an ongoing dispute over the interpretation of the “extraterritoriality” clause, that related to American “Proteges and Naturalized Subjects,” in the first American-Ottoman diplomatic agreement in 1830. After several months, Arbeely was forced to return to the United States. U.S. President Grover Cleveland appoints a Consul at Jerusalem, Nageeb Arbeely, to replace Selah Merrill. Shapell Manuscript Collection. HENRY GILLMAN, a librarian and a man of literature from Michigan, owed his appointment to his ties with the Democratic Party. He was known for his sympathetic attitude to the Jews and his assistance to members of the First Aliyah (Jewish pioneer immigrants ofthe 1880s). He is credited with recruiting Oscar S. Straus, the U.S. head of mission in Istanbul, to help the Jews. Gillman spoke Arabic and Hebrew; and his book, “Hassan, a Fellah: A Romance of Palestine,” described the country’s inhabitants in a rosy light. Gillman served as consul from 1886-1891. President Benjamin Harrison names Solomon Hirsch Minister to Turkey - the third Jew to hold that diplomatic rank. Shapell Manuscript Collection. In President Benjamin Harrison’s list of diplomatic appointments, Solomon Hirsch appears as U.S. Minister Resident to the Ottoman Empire, May 15th, 1889. William Blackstone was a Chicago businessman with strong social connections and ties to the government in Washington. He was an ardent evangelist who believed that Salvation for Christians would come only when the Jews returned to their land. In March 1891, he presented President Benjamin Harrison with a petition signed by 413 members of the Congress, governors, journalists, religious leaders, judges and other public figures, appealing for his help in settling the Jewish people in their “ancient land.” Blackstone’s initiative, which predates that of Zionist pioneer Theodor Herzl, received a mixed reception in the American Jewish community; and Selah Merrill, the U.S. consul in Jerusalem, complained that it would anger the Turks. Blackstone persisted, however, and in 1916 he submitted a second petition, this time addressed to President Woodrow Wilson. Blackstone’s initiatives contributed to the President’s decision to support the Balfour Declaration. Jerusalem Consul Edwin S. Wallace and Chief Rabbi Salant solicit American funds for the city’s yeshiva 'Etz Hachaim' and 'Bikur Holim' hospital. Shapell Manuscript Collection. The Reverend EDWIN SHERMAN WALLACE was appointed consul by the Democrat president Grover Cleveland to relieve Selah Merrill after the latter’s second term. Wallace liked the Jews and tried to help them, as mentioned in his book, Jerusalem The Holy, published in 1898. During his term and with his assistance, a renewed effort was made to establish Kollel America in Jerusalem. On the other hand, his attitude toward the American Colony, like that of his predecessor, was hostile. Merrill’s third and final term as U.S. consul in Jerusalem, starting in 1898, was also his longest. His strict religious views continued to color his attitude toward the Jewish settlers and his fellow-Americans. He despised Messianic Christian groups, labeling them as devoid of substance and even deviant. The scorn and negation he felt toward such elements in the Protestant world were turned in full on the American Colony, led by the Spafford family, who moved from Chicago to Jerusalem in 1881. Merrill accused them of being heretics and deviants. Their recurring confrontations, and particularly the affair of the American cemetery on Mt. Zion, led in the end to Merrill’s recall. He was reassigned to British Guiana, returned to the United States a year later, and died in 1909. Herzl directs U.S. zionists to protest Turkish discrimination against Jews in Palestine as matter of “equal rights." Shapell Manuscript Collection. Theodor Herzl, organizer and founder of the First Zionist Congress and the Zionist Organization, recognized that American Jewry had the potential to promote the Zionist agenda. In 1901, he wrote a letter to Professor Richard Gottheil, president of the American Federation of Zionists, calling for him and his colleagues to enlist the aid of Congress in opening the gates of Palestine to Jewish immigration. A jurist and long-serving mayor of Atlantic, Iowa, THOMAS WALLACE joined the consular service in 1901. After a stint in Germany, he was posted to Jerusalem in 1907. He was sympathetic to the Jewish community, and tried to help it in the face of Turkish government decrees on the one hand, and stringent American citizenship regulations on the other. WILLIAM COFFIN was a career diplomat who served in the Arabian Peninsula and Africa before his posting to Jerusalem in 1910. During his time in the city, he dealt in particular with the legal status of foreign subjects in the Ottoman Empire. He went on to serve in other consular posts after his stint in Jerusalem end in 1913. The kawas, consular guards, 19th century Edwin S. Wallace, Jerusalem the Holy, 1898. The American Consulate in Jerusalem.